Chauvet Intimidator Hybrid 140SR140W Moving Head with Zoom. 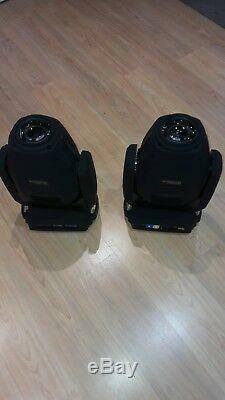 This advert is for the sale of 2 Chauvet moving heads. Usage time of the units are Lamp on time 00014 & remain time is 00237. Fitted with an intense 140 W discharge light engine and motorized focus, it projects crisp beams and gobos at almost any distance. Two overlapping independently controlled prisms create dynamic beam effects. Dual gobo wheels allow for gobo morphing and amazing mid-air projections. The motorized zoom works in beam, spot and wash modes for ultimate light control. Highlights True hybrid moving head fitted with an intense 140 W discharge light engine All-in-one light fixture morphs from SPOT to BEAM to WASH effortlessly Dual, overlapping prisms with independent control multiply the beam dynamics Dual gobo wheels allow for gobo morphing and amazing mid-air projections Motorized zoom works in beam, spot and wash modes for ultimate light control Unique ¼-turn hanging bracket allows for single or dual clamp mounting options Emit crisp projections at almost any distance using the motorized focus Glass optics ensure crisp beams and gobos at all times Flexible menu option accepts Osram 132 W lamps if needed Full-color display with IRC-6 compatibility, totem mode and onboard memory for storing a scene On-board power linking saves time running extension cords. The item "Chauvet DJ Intimidator Hybrid 140SR Moving Head DJ Stage Theatre Spot Wash Beam" is in sale since Sunday, January 20, 2019. This item is in the category "Sound & Vision\Performance & DJ Equipment\Stage Lighting & Effects\Stage Lighting Single Units". The seller is "07neptune" and is located in Leicester.